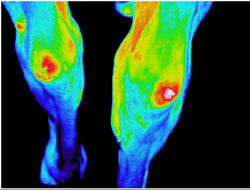 Any owner or trainer considering making the investment to purchase a horse can benefit from an infrared inspection. Whether you are considering buying a competition horse or "just" a family pony, the purchase of a horse can be a costly experience and along with your 5 star vet check a full body thermal imaging inspection is a small price to pay for your long term investment. Even if the history of the horse is known, a thermal imaging inspection of the horse will provide impartial information on its overall condition and highlight any areas of concern, as well as current or potential problems. The camera can also help to identify any existing problems that are effectively “masked” by anti inflammatory drugs. Alternatively, if you are selling a horse, the inspection can show the prospective buyers that the horse is in perfect condition. The thorough examination takes just under an hour and can be carried out either at the sales or if you are making a private purchase, in the stable yard where the horse is currently kept. An infrared inspection is a non invasive, stress free way of examining the horse and can give you an instant selection of images of the full horse enabling the purchaser to know immediately if there is anything untoward that they should be aware of.